Wanna say “buh-bye” to dang, nasty bikini bumps, razor burn, shaving nicks? Keep on scrolling my Remay Shave Gel Bar Review VLOG/VIDEO BELOW! Even better, please drop a “LIKE”, “COMMENT”, or even better “SUBSCRIBE“! New videos every Monday – your skin will thank you! As seen on Dragon’s Den… Remay is “a company with a mission to make shaving quicker and more enjoyable”… Seriously is that possible? So, they created this amazing, new shave gel bar! Quickly becoming the best alternative to toxic shaving creams or drying soaps… It cuts shaving time in half, plus it good for your skin! HOW & WHY REMAY WORKS? First, Remay creates a micro-barrier that allows your razor to float over-top skin. Making it easy to avoid nasty razor damage. To use, wet the bar and your skin (won’t work dry on skin), glide on, and shave! It’s best to apply in a circular motion to lift hairs! P.S: Yes, MEN can use this for shaving too! Don’t expect too much scent. Light and fresh is more their approach. Maybe a little bit of vanilla + tea tree shines through. No coconut smell at all. Most notably, it fits perfectly in your hand (no messes, no foam!) Also, love the case included. How many unprotected Lush soap bars have you had melt away to smithereens! Not gonna happen with Remay! Another bonus, pH levels in Remay are set to match that of skin. So it’s never drying! NO MORE DRY SKIN/LEGS! (Expires Dec.2018), courtesy of WhippedGreenGirl & RemayShave.com! WRAPPING-UP, REMAY SHAVE GEL BAR REVIEW! Goodbye are the days of messy, toxic, shaving creams! With just a little bar you can now easily shave in the shower, shave in the sink, even on an airplane! RemayShave.com is your razor’s new best friends. Welcome a new era of shaving! 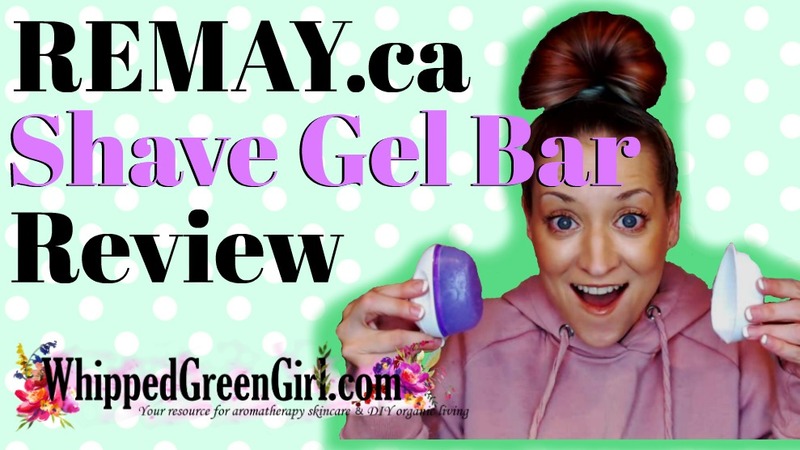 Thanks for checking my Remay Shave Gel Bar Review! Hope you enjoyed the video + read! For more on this stellar Canadian shaving company – see RemayShave.com! Watch my other videos too!